On first appearances, the tiny Stirlingshire village of Fintry might seem an unlikely location to draw a front line in the battle against man-made climate change. Like many settlements, Fintry's success was defined by it's natural resources, with the Endrick Water providing employment for many working the village cotton mill in the 1790s. But while Fintry's character is inextricably linked to the contours of the Campsie Fells and the historic dark stones of Culcreuch Castle, it is no longer just the community's past that is defined by its inherent resources. Fintry's residents have become visionaries in the quest for sustainable energy at affordable prices. The area's geography means many households are on high exposed ground. The result is equally high levels of energy consumption and fuel bills. When a commercial developer unveiled plans for a wind farm near the community in 2003, villager embraced the proposals as an opportunity to change things. The idea was to create a renewable electricity supply by buying a wind turbine at the wind farm and use the proceeds to fund a village-wide emission reduction programme. The main aim of the project was to reduce energy consumption and fuel poverty by funding projects that would cut dependence on fossil fuels. The initial scheme to buy the turbine was funded through bank loans and cash from the then Scottish Executive. However, by 2007 villagers had set up a charitable enterprise dedicated to cutting energy bills and consumption. Surplus cash from the project was also used to conduct a village-wide survey to assess energy saving needs like insulation and advice. In 2008, the Fintry Development Trust had received its first income from the turbine and had begun insulating households. In the two years since the turbine began producing energy, it has generated more than £200,000 for Fintry. That cash has gone towards insulating 50% of the homes in the village, with plans to insulate more and help households convert to greener energy. Those receiving cavity wall and/or loft insulation are on course to save on average £600 on their annual fuel bill. That represents a total increase in annual disposable income for the community of £91,352. The measures also means carbon dioxide in the village will be cut by 464 tonnes each year. Gordon Cowtan, one of those responsible for the turbine project, said the scheme's potential was yet to be fully realised. He said: "I think we would say that the project has definitely been worth it, although really we're still only at the beginning of the process in terms of the benefits received by the village. 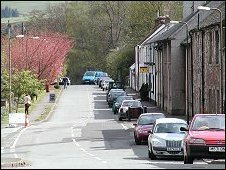 "The turbine has a lifetime of around 20-25 years and has been operational for only two so far so there's still a long way to go and while we've managed to deliver some benefits already, it's really over the next five to ten years that we would expect the village to notice the difference it's going to make."